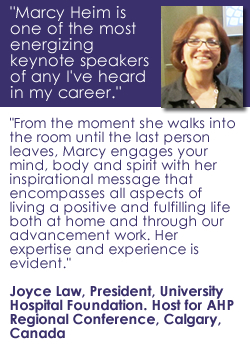 This is Marcy’s signature inspirational talk about the power and joy of generosity. This talk is appropriate for development and fundraising conferences and also any organization or group that wants to infuse energy in their feelings about money, giving and composing a good world. How our Thinking Impacts our Giving, and Living, Success! Marcy’s MOST requested talk. Here she engages her audiences directly and challenges them to explore the power of their thinking. She shares powerful tools to let us be aware of how our thinking can sabotage our success – in getting appointments to interacting with others. She gives specific tools to reprogram our thoughts leading to more success in our fundraising efforts…and our lives overall. This talk is excellent and inspiring for a luncheon or dinner group that includes donors, volunteers and staff. Focus your attention on your prospective giver and explore the factors that need to be addressed as you prepare for a successful, respectful ask. Then get specific, laser-focused training on writing and speaking an artful ask. We will DO it! 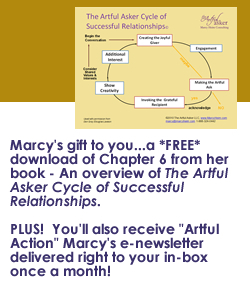 This is Marcy’s most popular session and she has empowered over 32,000 development professionals and volunteers with her simple, authentic and successful process. Marcy provides on-the-spot coaching as only she can. Not you average role-play, but indeed you will leave with a new skill and tremendous confidence! Promise! We need to See Something, Say Something, Do Something and Give Something to embrace the power and joy of true giving. This talk is excellent and inspiring for a luncheon group that includes donors, volunteers and staff. 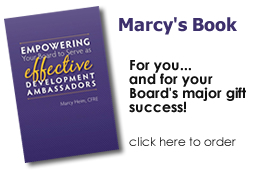 Based on Marcy’s best-seller, “Empowering Your Board to Serve as Effective Development Ambassadors” this presentation can be a 45 minute keynote or a full-day workshop. Is your leadership engaged in your development efforts with enthusiasm or avoidance? Is their role in the development process defined and understood? Join us for an overview or a full-scale workshop with Marcy designed to give Board members and other volunteers the tools needed to create positive and productive relationships that yield long-term, life-long friends and investors in your mission. With the right understanding of the development process, volunteers will gladly take actions that facilitate the thoughtful relationships with others needed for development success. Development Work – It’s all Improv! View your role as a development director through a different lens…that of an actor. We talk about being “on” in our development work, so why not embrace a few skills borrowed from the world of improv theater and learn how to adapt them to what we do? But be clear, this is NEVER at the expense of fostering genuine, authentic and honest relationships with our donors and volunteers. Development work is an honorable and noble profession. Yet today development professionals stay in their positions on average only 18 months. Is the pressure to “close” and “make the goal” robbing us of living with passion – personally and professionally? What role does our mindset play in our development and life success? With over 25 years of in-the-trenches successful major gift work, Marcy Heim will reconnect you with your core values and rekindle your passion for, and commitment to, manifesting the genuine relationships with your donors that bring you true success. Every donor is unique. What can we as an organization do to provide proper gift stewardship – the gift acknowledgement, tax receipt, legal paperwork? And how can we best provide donor stewardship. What says thank you in a way that is donor-focused and deeply meaningful? How do email, Facebook and other social media fit into this picture? We provide stewardship because the best prospects for future gifts are current donors. Well, yes, BUT the real reason for good stewardship is really…it is the right thing to do. So why is stewardship often just an afterthought instead of an integral part of our development plan? In our session we’ll contrast stewarding the donor with stewarding the gift and how this fits into your overall and specific prospect plans. We’ll discuss ongoing stewardship as part of enhancing our major gift relationships and increasing our givers connectivity and enjoyment in their philanthropy. We will highlight elements of a thoughtful stewardship plan that serves donors across the gift pyramid. Development is often discussed as requiring a feel for the art of fundraising. — Developing a ‘touch’ for knowing when to make the ask…providing ‘thoughtful stewardship’, making ‘meaningful ‘ contacts and making ‘artful’ asks. Managers will also describe major gift development as the ‘time line’ needed to close the gift, the ‘number’ of asks to be made/month or quarter or the ‘quarterly dollar goals.’ How do managers and major gift officers find balance in respecting the donor and conducting major gift work that creates positive long-term donor relationships while still meeting the bottom line, provide data-driven evaluations and increase the dollars raised. What about planned giving? How can we make the science support the art? Call 1-888-324-0442 or email Marcy for availability and rates.